My local homebrewing club, the Charlottesville Area Masters of Real Ale (CAMRA), is currently in the middle of a group bourbon barrel project. Some elements of the project have been covered in previous posts on organization and group brewing. After individually brewing the beers, it was time to gather and fill the barrel. Barrels are plugged with a wooden bung, that seals the cone-shaped hole on the top stave of the barrel. Bungs are often hammered in and can be difficult to remove. The CAMRA barrel's bung was flush with the surrounding stave. There seemed no easy way to remove it without damaging it until the club organizer thought to use coarse wood screws to attach metal brackets to the bung. Then we were able to apply leverage and twist it out. The CAMRA barrel was empty, but smelled fantastic of Virginia Gentleman from the A. Smith Bowman Distillery, which is the bourbon it contained. 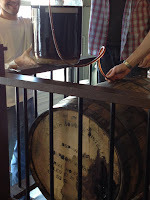 If the barrel contains any liquid bourbon, it is advisable to collect it, as mixing it in with the beer will likely give an overwhelming bourbon character. There is plenty of bourbon absorbed in the wood already. 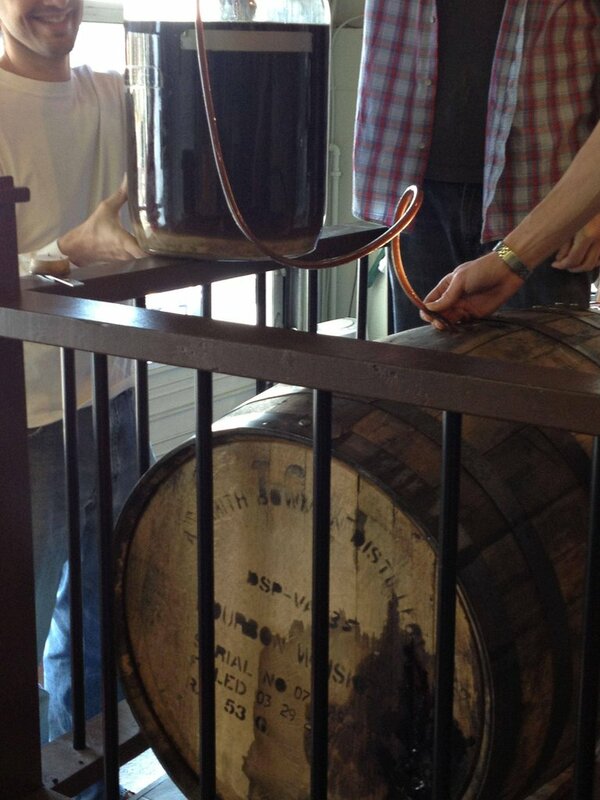 The lack of bourbon in the barrel increased our fear of barrel leaks, but we decided to proceed anyway. The barrel was stored on a small barrel rack at a local homebrewing shop, Fifth Season, and we could watch underneath the barrel to catch any developing leaks early. 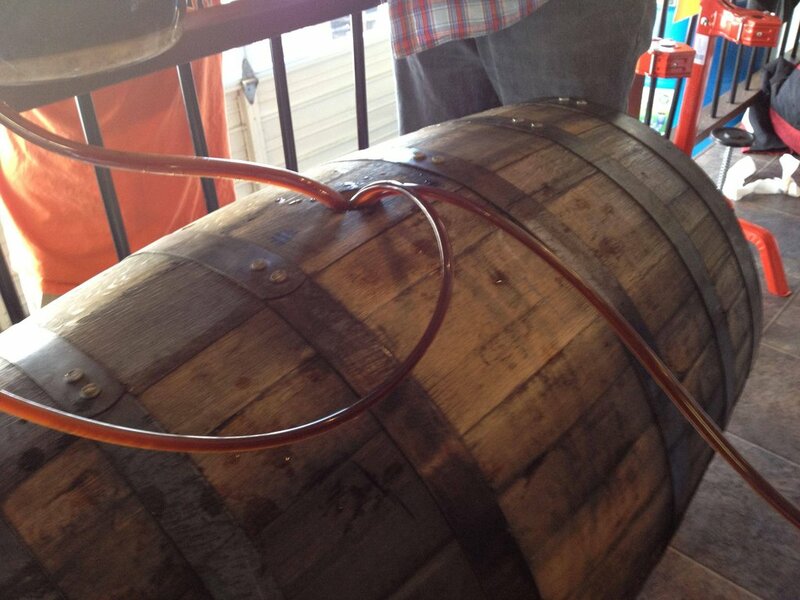 The barrel fill went very well and our batches of fermented beer were siphoned in rotation into the barrel. The project had nine brewers, with two of us brewing double batches. We had intended one of the double batches to provide a 5-gallon keg to top-up the barrel if beer evaporated. Having extra beer on hand was fortunate, as we needed half of the top-up keg to fill the barrel completely. It is always better to have a little more beer on hand than be short and risk increased oxidation through the barrel headspace. The barrel is now topped up and has an airlock in case of changing pressures. The plan is to taste it in a month and see how the flavors are developing. We do not want to taste it more frequently and risk oxidation or infection. Because new barrels can quickly provide bourbon and oak flavors, it is likely we will need to change the beer out in as little as a few months. Thanks again to Fifth Season for hosting the barrel and to Greg W. for organizing the project. I am looking forward to seeing how the beer turns out. Poll: Next Lug Wrench Collaborative Beer? AHA Governing Committee - Vote! Poll: Most Important Thing for New Homebrewers?